Searching for the right job is a tedious task, but getting that job is harder. There are people who complain about how they never got the job they deserve and how unfair this interview system is, Are you one of them who blames others for their problem? We hope not. There are people who got multiple job offers, not because they have something extraordinary in them, but because they know what they want and work hard to get that job. Proper homework is what you need, but this is not the end of this. People often wonder about the secrets of people who always get the job offer, but there is no secret, they just know what to do, when to do and how to do. You may be wondering that you do everything they do, but no, there still needs improvement. In this article, we are going to discuss the secrets of people who always get the job offer so that you can apply those secrets and get your dream job. These secrets are not some deep hidden magic tricks, but the way to know how to get the job offer. We are going to discuss these secrets thoroughly so that you know what to do, how to do and when to do because time is crucial in an interview and you have only a limited period of time to prove you are the best choice. Are you one of those people who rely on online job boards? Nowadays everyone uses the online system to search for the job, but the truth is, not the entire job posted online fall through the online application. The people who always got the job use online job boards as a medium to know the requirement of the company and which company is recruiting. They use their links and contacts in the company to land an interview rather than applying online and wait for job call. The direct approach helps in landing the interview and make sure that they have good references from the company. The company trusts that interviewee who came through reference rather than those who manually applied and then got the interview call. It is one of the important facts that help certain people in getting the job offer because it is easy to trust the person who already works for you and the person he refers rather than the person who is coming through a manual procedure. So, don’t just rely on job boards and use your links and contacts wisely. 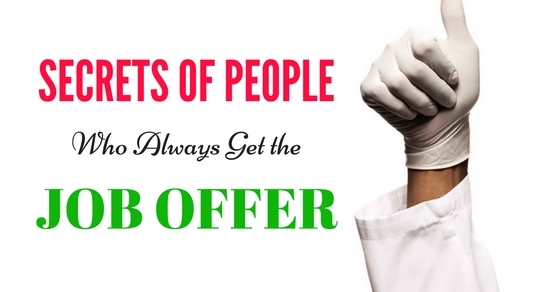 Have you ever wondered what is so special about some people that they always get the job offer? Yes? Then you need to know that there is nothing special about these people. What is special is their approach before the interview. This is one of the secrets of people who always get the job offer; they never sit idle and wait for the opportunity. They start their work even before they receive interviews, call and that plays very important role in getting the job offer. If you want to land the job you want, then prepare even before the interview. We all have ideas about what we want to do and what type of job we want, so why to wait for the call. Start your preparation about the job so that you have plenty of time to cover every aspect of the job. When you work on the job before you start searching for the job, it prepares you well. You have more knowledge and you have thoroughly understood the job and the company you are applying. So, do your homework well and don’t wait for the interview call because then you will have no time to prepare. Are you one of those people who never really give importance to their resume? If yes, then this maybe the reason you never really get a job offer. Have you wondered how much time an interviewer spends on a resume? Hardly 6 to 10 second and these few seconds decides, are you going to receive calls for an interview or not because your resume is your window where you show how qualified are you for the job. The people who always get the job offer are those who spend a great deal of time and prepare their resume very articulate and effectively by creating the clutter of information. Use your 6 seconds wisely because these 6 seconds have so much power. They can decide whether you are good enough to call for an interview or your resume is good enough only for trash bin. Don’t make the clutter of information, write in a way that all important information displays accordingly and your resume defines you accurately, If you waste these 6 seconds, then you may not get a chance again in the same company, so use them wisely. Good communication is the key to success and a good listener is always the one people remember even after communication. Good communication skills and good listening skills always come handy when you apply for the job. Good communication and good listening capabilities are one of the secrets of people who always get the job offer. They interact with people and know what to say and when to say which work in their favor most of the time, on the other hand, they listen very carefully and always show interest. So if you wonder about the secrets of people who always get the job offer then learn to interact with people and interact means a good communication as well as look interested when you are having important conversations, which have your jobs in hand. Good communication and interaction, looking interested in conversation is your life saver in any situation, whether related to the job or your personal life so learn the skill of communication. In this world of globalization, social media is an integral part of our life. We spend a great deal of time over social media to interact with friends and for many other reasons, but the important part we miss is the use of social media in our professional life. We often ignore the importance of social media in our life; we cannot separate us even if we want to. Even companies understand the need and the power of social media and this is the reason they track and look into the profile of potential employee to know about his social etiquette and behavior. So, do not ignore your social media profile, make it better even better than your resume because your social media profile speaks volumes. Keep track of the things you share on your social media profile and avoid anything which has an inkling to controversies or not appropriate for the social platform. This is the secret of people who always get the job offer; they always take care of each fine detail and make sure that they represent themselves as a perfect candidate for the job. One of the grave mistake interviewees do is not doing the research prior the interview and one of the secrets of people who always get the job offer is that they do proper research and work before an interview. It is important for you to know about the company, their work, what are their specialties and other information because it shows that how interested you are in the job and the company you are giving interview for. It also shows that you are very serious about your job and have done your homework before the interview. The well prepared interviewee has been always ahead of the other because he/she knows what they are getting themselves into and what they expect from the company and the job. A company needs a smart candidate who knows their place in the company and can work easily among others, that’s why you need to be well prepared with your own research about the company and the job you are applying for. So, don’t hesitate from all the hard work you do before the interview because this is going to pay in the form of a job offer. One of the keys to success is having a good control over your emotions, but that doesn’t mean you cannot show your happiness and enthusiasm. The people who always get the job offer know how to react in a particular situation and they have better control over their emotion no matter what the emotion is. Our emotions play an important role in our lives, so does in our professional life. The people who don’t show emotion come as rigid and ungrateful and the people who over show their emotion come as an emotional fool. So it is important to have some sense about when and how to show emotion. There are many situations before the interview, in the interview and after the interview, which test your patience, nature and how you deal with a different situation. When you have better control over yourself, you show mature behavior and deal with the situation in a gentle man way. So, learn how and when to show emotion and learn the art of controlling your emotions, but never come as an emotionless person, show appropriate enthusiasm, interest and happiness if you got the interview or the job. Yes, eagerness to learn is one of the secrets of people who always get the job offer. Each and every situation we face in our lives teaches us important lessons which are for our own benefits. Never shy away from your mistakes and failure, accept them with an open hand because they are the first step toward success and secret of people who always get the job offer. A smart person takes advantage of such situation and improves for the next time and that make them the right person for the job. Learn from your mistakes and show eagerness to improve because overconfidence always takes you down the hill. The people who have an eagerness to learn, to know what their weak points are and how to improve them as well as how to accept their mistakes are truly successful. So, show the eagerness to learn but most importantly, don’t come as desperate because when you behave like a desperate person it shows your weakness and lack of patience. A positive attitude is what makes them different who always get the job offer. They never leave the hand of the hope and one fail attempt does nothing to their positive attitude. These people know that there are good opportunities for them and if they can’t get one job they will have another. Bring a positive attitude in your life and also show positivity in your interviews, never cave even if your taste failure, but keep going because that’s the golden rule of success. In this article we had discussed secrets of people who always get the job offer, but the fact is, no one is 100% successful and failure is something we all face in our life more than once so, don’t hesitate from your failures and learn from your mistakes may be the next opportunity is the one for you. There are particular rules and regulation about success, but there are a few fundamental points which are applicable to all. We hope this article can help you in getting your dream job, but remember success doesn’t come to those who do not make efforts, so always give your best and keep learning. Never give up if you fail in your attempts because failure is the first step toward success and only they can climb the mountain who knows how to fall.